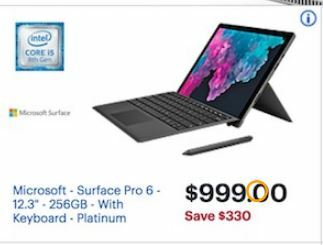 Find the best deals on the Microsoft Surface Pro 6 and Surface Book 2 for Black Friday 2018. 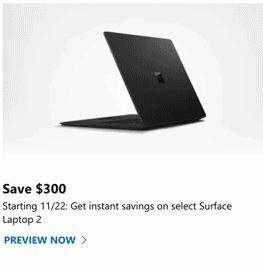 We have visited dozens of online and print ads to collect the best sales and discounts on the latest Microsoft Surface tablets and laptop computers between Thanksgiving Day and Cyber Monday 2018. We will bring you info about the biggest and best deals and discounts here when the savings are announced online or in an advertisement. We are committed to helping you find the best shopping deals of the year from Amazon Prime Day to Thanksgiving Weekend. So get ready to save in 2018, 2019, 2020 and beyond! We expect we will see at least one good deal on the new Microsoft Surface Pro 6. It is an ultralight and versatile detachable PC with the latest 8th Generation Intel Core processor. Starting weight at just 1.7 lbs. Run it in laptop mode, studio mode or tablet mode thanks to the built-in kickstand and type cover. Write and draw with the Surface Pen and touch. Syncs with your iPhone or Android device. All day battery life offers up to 13.5 hours of video playback. Regular price starts at $899. Additional configuration options available. Click here to find the latest deals on Amazon. As the official store, they carry a full line of the new Surface Pro and Surface Book 2. The Microsoft Surface was the first personal computer designed in-house by Microsoft. The first-generation was announced and released in 2012. The first Surface was a hybrid tablet computer. 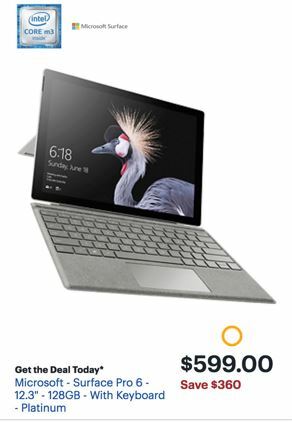 Its successor, the Surface 2, was released in 2013; Microsoft stopped manufacturing it in early 2015. he Surface Pro 3 with a more powerful Intel Core processor was released in 2014 and competes with high-end ultraportable laptops like the Apple MacBook Air. The Microsoft Surface 3 is a 2-in-1 detachable utilizing the x86 Intel Atom system-on-chip architecture released in 2015. It is less expensive than the Surface Pro 3 in exchange for less power/performance. The Surface Pro 4 was originally released in October 20115 in the United States. It is the fourth generation 2-in-1 detachable from Microsoft. The Surface Pro comes with Windows 10 Pro and is backward compatible. The latest version of the device is marketed as the Surface Pro or the Surface Pro 2017. It includes the 7th-generation Intel Kaby Lake Core processors m3, i5 or i7. We will also be keeping our eye out on any deals on the Microsoft Surface Book 2, a 2-in-1 personal computer unveiled on October 17th and released on November 16, 2017. This is the sequel to Microsoft’s first laptop. Since it was just released, there’s no guarantees that there are any discounts at this point. The regular price of the Surface Book 2 is $1,499. 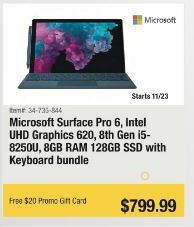 We have full coverage of Thanksgiving weekend deals on desktop computers, laptops, tablets and other electronics this year. If you haven’t found the right deal yet, stop back soon as we are adding more daily here at Funtober.